The good news is that there is a broom wagon for La Marmotte. The bad news is that it won't get you back home until really quite late in the day and it will probably be an immensely frustrating afternoon. If you're worried about being swept up by the broom wagon, don't be. In some races (eg the Etape du Tour or the Berlin Velothon) the broom wagon is aggressively policed and if you are lagging a little bit behind the pace then you are liable to be scooped up. This is not the case in La Marmotte. Basically, if you want to finish the Marmotte in your own time then no one is likely to stop you. Evidence of this is that when I was heading home for bed at 10.20pm on the 2018 Marmotte there was still a British man walking up the second last bend of Alpe d'Huez (in his socks with his shoes attached to his handlebars!). The best way to get the broom wagon is to wait for it to turn up at one of the feed stations. The obvious ones are at the top of the Telegraphe, the stop two kilometres outside Valloire, the top of the Galibier (although this is not a good place to wait because it gets quite cold and is very exposed) or at the feed station in Bourg d'Oisans at the foot of the final Alpe d'Huez climb. You may be able to get the broom wagon to pick you up from the side of the road but it is much harder to persuade them to stop and the buses are often full. 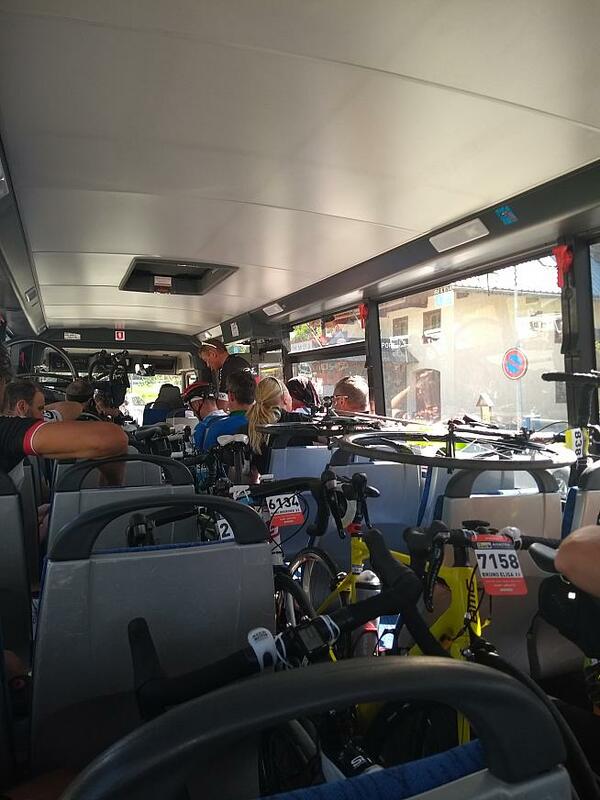 My own experience of the broom wagon was from the 2018 Marmotte where I was overheating and cramping in both feet by the time we got to the Valloire food station, which is 100km into the ride (and about 3,050 metres of climbing). I waited over four hours for the broom wagon to arrive and when it did eventually turn up there were 18 riders trying to get onto it. The bike carrier at the back could only fit seven bikes so the remaining bikes had to come in the bus with us. When we eventually set off we went about one kilometre before we met four more riders who had abandoned. We then sat around for 30 minutes while Marcel, the driver, worked out what to do with these riders (he called back to get another bus to pick them up but wouldn't drive on until the other bus arrived so we sat in the boiling afternoon sun with no air conditioning, waiting for the bus to arrive). Inside the broom wagon...bikes everywhere. The bus then drove us in a somewhat hair-raising manner (the man next to me feared that he had abandoned for the good of his health, only to die when the broom wagon plunged off the side of the Galibier) along the route until we reached the Bourg d'Oisans feed station. There about one third of the broom wagon occupants got off because they had hotels/cars nearby and then we waited in the heat for nearly another hour for the organisers to decide which buses were going to go when, all of this with no information being passed to us about what was happening. We eventually set off for Alpe d'Huez and were finally dropped off at 8.20pm, over three and a half hours after we had been put on the broom wagon. In retrospect, I wish that three or four of us who had abandoned had asked the hotel opposite the Valloire feed station (Hotel Relais du Galibier) to order us a taxi to get home. It would probably have cost in the region of 200 euros but I would have happily paid 70 euros to get myself back three hours earlier and have my recovery time in somewhere other than a swelteringly hot school bus.